It’s okay to admit it: you have no idea what you’re doing. There. Doesn’t that revelation make you feel so much better? Acknowledging that you’re not sure what you’re doing is the first step towards a successful and fulfilling Sugar Baby journey. And now I’m going to help you take that next step to help you realize what you want. The first step of your Sugar Baby journey – after admitting you’re not sure what to do, of course! – is to acknowledge your goals and intentions. What do you want out of your Sugar Baby experience? What do you want out of this lifestyle? How will your Sugar Daddy connect you to a better lifestyle? Write these goals down. Pin them up on your bathroom mirror. Keep them around at all times – because you’ll always need to be reminded of what you want from your Sugar Baby journey. Now that you have a better idea of what your goals are, you’re going to want to align them with the Sugar Daddy you want. Remember: not all Sugar Daddies are equal, and you’re going to want to find the right one for you. 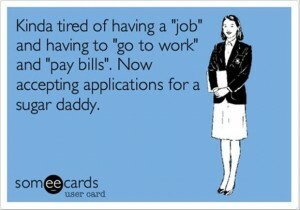 So go ahead and get on that Sugar Daddy dating website. Find a few profiles that really catch your eye. Now that you’ve narrowed down your dream Sugar Daddy, you’ll want to craft your online profile to appeal directly to him. Your Profile tells a story. You want to tell a story with your personal ad and capture their attention to want to get to know you. Once you’ve got his attention, you’ll need to set up the date with your Sugar Daddy, build up his trust, and sustain your Sugar Daddy relationship. But those are for different articles – right now, you need to focus on getting your dream Sugar Daddy’s attention. So ask yourself: what are your goals? How do you see this lifestyle going for you? What are you truly willing to invest in your Sugar Baby journey? What are you going to do about it? A sugar baby with out goals, aspirations and direction becomes a prime candidate to be taken advantage of and have nothing to show for her hard work. Having goals gives you something to work for and helps to establish one’s self worth. I agree with you! Goals are important and without them a Sugar Baby can become lost and start focusing on the immediate instant gratification and can lose sight to why she wanted to enter this lifestyle to begin with. Taylor you nailed it. As a SD I cannot tell you how many women I come across who are mentally so disorganized in their approach to this lifestyle. If only more people would define their goals and take the time to actually write them down and reference them throughout the course of their daily activities, especially where it involves their relationships. Women have to understand that men enjoy a woman who actually knows what she is looking for and will not waste each others time. Thank you! Goals are definitely a Sugar Baby Best-Friend. Without goals…how do you know which way you are going? I’m preparing to start my sugar baby journey. I’ve spent the last week doing research on everything EXCEPT sugar daddies themselves. In all honesty, my life hasn’t started yet. I’m very young and I’m worried that my inexperience and naivety will have them overlook me. I’m worried about what to do once I sign up for Seeking Arrangement. I have my goals down and I know what I want/need. I’m just worried that I may not have what anyone is looking for. What should I do? Hey Marissa, I created the SD Formula for you and the book to serve as your guide to help avoid those Newbie Mistakes. After all, you will need more than just a website to get you what you want. The dating site make it convenient, but they don’t tell you what you have to do to get what you want. They don’t tell you how to ask for what you want etc. Having goals is great to understand why you are here, but why would a SD want to do those things for you? What you want and what a SD wants are two different things. You will have to build a form of a relationship. This lifestyle is what you want it to be, and your own behaviors will create the experience you receive out of it. I’d love to become a fulltime Sugar Baby; someone who’s an accountable Sugar Daddy. There are a lot of scammers and liars out there, I’d like someone who I can trust and have a great beneficial relationship with. Being a full-time Sugar Baby might sound lovely. But what if you are 100% fully dependent upon a SD and everything seems to be going as it should. But what happens if your SD goes missing and you never hear from him again? Don’t ever put yourself in a situation without a backup plan (even if the situation is great). Nothing is guaranteed.